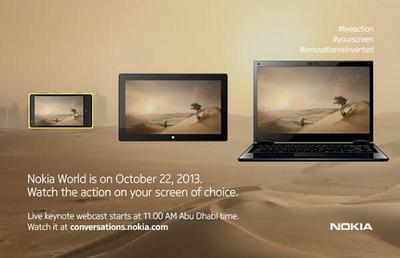 Nokia has a big mobile announcement—possibly its last ever—coming up on Oct. 22 in Abu Dhabi, UAE. Today, the company announced it will stream the event on smartphones, tablets and computers live from Abu Dhabi, UAE, where Nokia World is set to take place. According to recent reports, Nokia will unveil six new devices at the event, and although we have a few ideas of what to expect, that still leaves space for a few surprises. Numerous leaked photos of the company's first Windows Phone phablet, a six-inch quad-core device allegedly called the Lumia 1520, will almost certainly make an appearance. There's also the rumored Lumia 2520 Windows RT tablet, though we're a little less sure on that one as it's only leaked a few times. We're not sure how Nokia will fill out the rest of those slots, though we do have a few ideas. There will likely be at least one Asha device, the 500 recently leaked online, and the company may also rollout another low-cost Lumia handset as well. The big question, however, is whether we'll see the rumored Lumia Android device. Following the news that Microsoft would takeover Nokia's mobile business, we learned the Finnish company had been experimenting with an Android phone. It's a longshot, but this may be the phone-maker's last chance to show the alleged device to the world.